 A promising premise: suburban families transported to a land of magic and wizardry. When the people on Chestnut Circle awake one fine morning during the Vietnam War, they discover that an ancient dragon has conveyed their block across realities into its realm. Upon finding themselves in this different place and time, the assortment of fine upstanding citizens, drunken wife-beaters, vice-principals, and their adolescent children is immediately confronted by a strange collection of soldiers, wizards, and wolves. The dragon occasionally wakes from its slumber to wreak some havoc; the adolescents and the adults variously adapt to their new world. But the mythic characters are so strange that Gardner can't provide solid enough ground to propel the plot. Also, the treatments of the psychologies of the teens, whether confused by their sexuality or working out some aggression toward their parents, are too quick and facile. 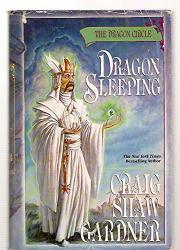 This long, plodding tale, Gardner's hardcover debut, leaves more than the Dragon snoozing.